The Business True Confessions Sweepstakes may be over, but that doesn't mean we still don't have a couple of screens to fill before the grand prize winner of the Barbados vacation is announced. So click here for a recap of all 10 weeks' survey responses. Know what's happening at Business Week Online: Sign up here for our Insider's Newsletter, and we'll keep you in the loop with timely alerts of new features, must reads, and special events. Currently, every Thursday night, the latest issue of Business Week will be posted. The complete U.S. and International editions will be available, including graphics, tables, and selected photos. What's your interest? Investing, computers, business school...? In BW Plus! you'll find a rich collection of Business Week content conveniently arranged for browsing by topic -- plus online-only features that don't appear in print. BW Plus! is Business Week and more. The quick-hitting business news you need every day. Domestic and global market info (and lots more) from Standard & Poor's MarketScope, alerts to the day's key economic reports and meetings, and breaking news stories from Business Week's worldwide staff. Begin -- and end -- every business day with BW Online's Daily Briefing. Maven is your personal guide to personal computing. It offers easy-to-understand ratings of desktops, laptops, monitors, modems, and printers, and with the interactive PriceWizard, it lets you configure and price a desktop or laptop that's right for you. Maven is a joint project with NSTL, a McGraw-Hill unit known worldwide as the premier independent computer-testing lab. How are your stocks doing? Is the S&P 500 up? The dollar down? Get the answers here in Quotes & Portfolio, where you can also create and track your own investment portfolio, chart historic stock info, and lots more. The library is open. Try our new, fully searchable archive. 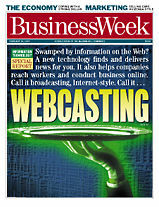 Plus: A selected archive of previous Business Week stories is available for browsing. Included are all Cover Stories back to the issue dated Oct. 16, 1995, as well as hundreds of other selected stories (see BW Plus!). New! As an offshoot of our Daily Briefing service, we're now posting Flash Surveys. Stop by regularly to register your opinions in our short, to-the-point surveys -- then come back to see how your responses compare with everyone else's. Business Week joins with sister publication Architectural Record and the American Institute of Architects to honor architects and their clients who use good design to achieve strategic business goals. A call for entries. This service is temporarily suspended. Throughout the business day, you can hear hourly market and business news updates in RealAudio format from Business Week's on-air correspondent, Ray Hoffman. Tune in right here! Each week, Standard & Poor's Compustat, a McGraw-Hill unit, provides a wealth of in-depth financial information on a company featured in a BW story. You'll find balance sheets, income statements, cash-flow statements, historical market data, and more. Who we are -- and how to reach us. Send us your comments, questions, suggestions: We want to hear from you. More than that, we want to get to know you! Click here to find out all you need to know about advertising opportunities on Business Week Online and in Business Week magazine. You'll also find plenty of information about the Business Week people who are here to serve your needs. Copyright 1996, by The McGraw-Hill Companies Inc. All rights reserved.